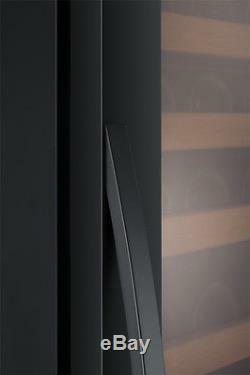 Allavino Classico Series 174 Bottle Wine Cooler Refrigerator Black Glass Door. 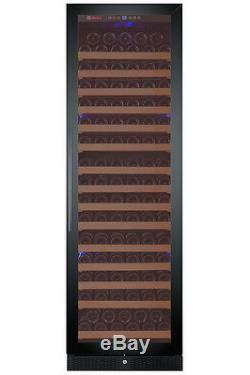 The Allavino YHWR174-1BWRN FlexCount Classic Series Single Zone Wine Refrigerator is an elegant and convenient wine cooler that has been designed with alluring features to help bring the opulence of a professional wine cellar into your own home. 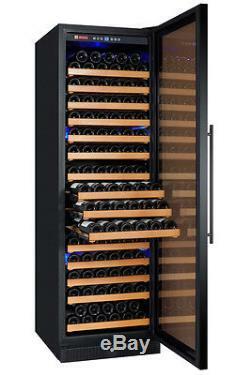 The wine cellar features a black cabinet, a sleek black framed glass door on a right hinge, black curved and towel bar handles, interior blue lighting, and a door lock. 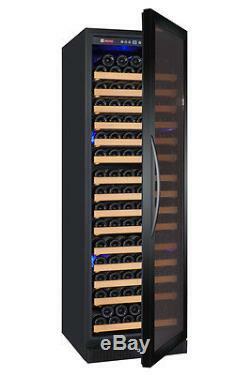 Wine cooler includes a LED temperature display with push button controls and a temperature range between 40 and 65 F degrees that can be displayed in Fahrenheit or Celsius. Allavino's wine refrigerator comes equpped with 15 hardwood shelves with beveled shelf slats that are capable of storing and cooling up to 174 bottles of wine at one time. Stylish and versatile, this wine cellar has finished sides and top for freestanding use, as well as a front-venting design that allows it to be built-in to cabinetry. With it's sleek black cabinet and frame with curved handle, UV protected glass door, and cool blue LED lighting, Allavino's Classico Series YHWR174-1BWRN Wine Refrigerator is the stylish showcase your wine collection deserves! 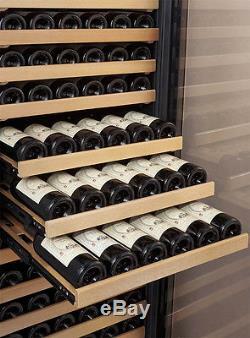 This wine cooler can store up to 174 bottles on sturdy and beautiful wooden shelves that extend out on telescoping roller guides, providing easy access to every bottle. 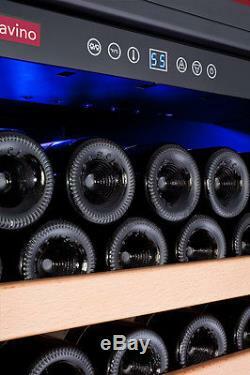 Thanks to its digital display with user-friendly push button controls, you can enjoy precise control over the wine cellar's quiet and energy efficient cooling system to ensure that your wine is being stored in it's optimum conditions. Whether you wish to build this wine cellar into your kitchen cabinetry or use it freestanding in your dining room, a front-venting design and finished top and sides give you the freedom to store your favorite wines in nearly any room in your home! Our intelligently designed state-of-the-art compressor is efficient enough to meet strict California Department of Energy consumption guidelines while remaining powerful enough to provide superior cooling. To ensure that every bottle in your collection is being stored in the desired temperature range, internal fans circulate cool air throughout the cabinet, eliminating hot spots and providing a faster cooldown. An intuitive digital display with push-button controls makes precise temperature adjustment hassle-free. The interior temperature can be quickly adjusted in 1 degree increments by simply pressing the up and down arrows, and the LED display shows the set temperature during adjustments and then the current temperature to allow you to easily monitor how the unit is performing. This powerful control panel also lets you change the display from Fahrenheit to Celsius, illuminate the cabinet with cool blue LED light, and turn the power off with the push of a button. 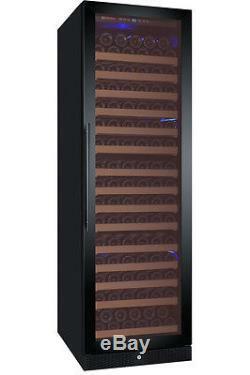 This stylish and versatile wine refrigerator has a sleek finished black cabinet that makes for an elegant freestanding display, as well as a front-venting design that gives you the option of building the unit directly into your cabinetry so that only the stainless steel framed glass door and toe kick are visible. 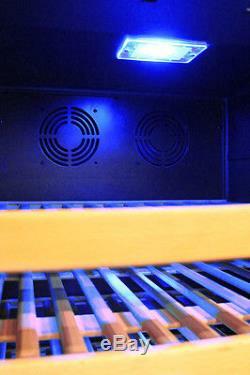 Additional features like cool blue LED lighting and beautiful wooden shelves help bring the opulence of a professional wine cellar into the comfort of your own home. Your wine is in safe hands thanks to sturdy wooden shelves that cradle each bottle, reducing harmful vibration that might disturb your wine's sediment during long-term storage. For quick and easy access to both front and rear bottles, telescoping roller assemblies extend all but the bottom shelf, so you no longer need to remove bottles in order to reach something behind them. 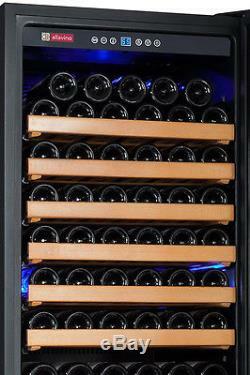 Up to 174 bottle capacity This bottle count is an estimate based on 3 diameter standard wine bottle. If you have larger bottle diameters, you may hold less bottles per rack or you can remove racks to accommodate the larger bottle sizes. Black Cabinet and Black Framed Glass Door with hinge on right. Door is not field reversible. 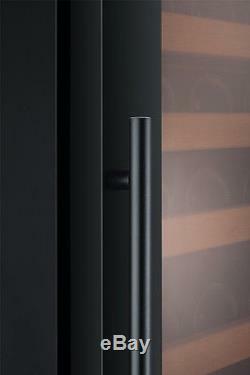 Black Curved AND Towel Bar Handles. Can be set between 40 and 65 degrees Fahrenheit. Temperature can be displayed in Fahrenheit or Celsius. Fan-forced cooling for even temperature distribution. 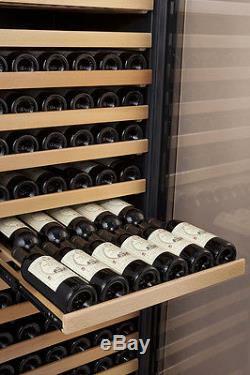 Beveled shelf slats securely cradle wine bottles to reduce vibration. Telescoping roller glides extend shelves far enough to access rear bottles. Dual Paned Glass Door with UV Protection. We realize that there is no "standard" bottle size anymore. Here is a small sample of bottle size variations and how they can affect your overall bottle capacity. Each of these bottles are 2 3/4 at the base but have varying shoulders and overall heights. Bottle A is the ideal bottle size. The bottles are just short enough that the neck of the back bottles fit between the shoulders of the front bottles without touching and the 2-15/16 diameter allows plenty of room between bottles. This allows you to fit 20 bottles on the top rack and 11 bottles on the other 14 racks with a total capacity of 174 bottles. Bottle B is taller than the average bottle at both the top and the shoulder. If only using this size bottle, the top of the rear bottles on the rack would hit the shoulder of the front bottles on the rack and push them too far to either side to have bottles all the way across the front of the rack. We were able to fit 8 bottles on a shelf, with one bottle in front and another bottle in the back, then skipping a groove before adding another bottle in the front. That would reduce the overall capacity to 134 bottles, if your entire collection were this size but you can have bottle B in the back with bottle A in the front of each rack and still achieve the maximum capacity of 174 bottles. Bottle C also works well. It is 2-3/4" wide at the base, but 3 1/4" wide at the shoulder. The grooves are spaced enough that the shoulder will touch the bottle next to it, but the height still allows you to fit the normal amount of bottles on a shelf for the full 174 bottle capacity. Bottle D is wider, with a diameter of 3-1/2. They still fit on most of the shelves without having to remove a rack, but they require that a groove be skipped between the bottles which reduced the bottles per shelf to 8 on the upper shelves and 5 on the bottom shelf. That would reduce the overall capacity to 117 bottles if your entire collection were this size. We understand that every collection is different, and we hope that providing this information will help you determine how your collection will work with this product. 27.0" (28.75" w/ handle). BOTH Towel Bar AND Curved. Drivers do not assist with unpacking, set-up, or clean up. Packages are sent Signature required. All standard deliveries will be brought to the door or threshold of your house or building. All truckline deliveries must be inspected upon arrival. Please inspect the exterior of the packaging for damage. Make a note of any exterior damage on the bill of lading. Save all packaging and do not destroy boxes etc. You have 48 hours to file a damage claim. Claims filed after 48 hours of receipt may not be honored. To initiate a return, please contact our Customer Service Department. Once you obtain your Return Authorization Number, you have 30 days in which to get the product back to us. It is important to save all packaging and not destroy boxes in case of a return. We offer unique products to make, store and dispense your favorite beverages! We bring over a decade of experience and knowledge from the brewing and beverage industry online. From our extensive line up of kegerators and wine storage units, to our water dispensers and draft beer parts, you'll find our specialized selection of beverage equipment second to none. We're committed to continually bringing unique and exciting beverage products and appliances to you at great low prices. In addition to our great product selection and low prices, we believe in direct access customer contact. When it comes to sales & service, we promise. We try to offer the prices will be the best anywhere. Our goal is to provide a source where home owners, business owners, aficionados, and hobbyists can find beverage equipment and hardware to fulfill their particular needs. So whether you're building a home bar, designing a custom wine cellar or looking for a special gift, Beverage Factory would love to earn your business. The Beverage Factory 8510 Miralani Dr. The item "Allavino Classico Series 174 Bottle Wine Cooler Refrigerator Black Glass Door" is in sale since Wednesday, October 28, 2015. This item is in the category "Home & Garden\Kitchen, Dining & Bar\Bar Tools & Accessories\Wine Fridges & Cellars". The seller is "beveragefactory" and is located in San Diego, CA. This item can be shipped to United States.